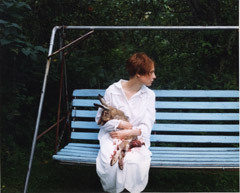 Photographer Aino Kannisto, born in 1973 in Finland and working in Helsinki, is now presenting her first solo exhibition outside Finland - Staged Photographs at Galerie m Fotografie in Bochum. "I create constructed images. I manufacture fictional scenes, which I capture with my camera. I myself play the characters in my pictures. But these are not self-portraits in the traditional sense. The person in the picture is a fictional narrator, just like a narrator in literature. My pictures are fantasies; I represent an atmosphere or mood through the fictional characters. Fantasy is a way of speaking about emotions." On closer inspection, her photographs have an irritating, unnerving effect. The location where each photograph takes place, and the appearance and behaviour of the artist/narrator/character, differ from image to image. Each picture tells its own story, but could very well be part of a fictional order within the image series, or part of the story told in another image. The most disturbing aspect of Aino Kannisto's images of herself are the subtle signs of violence, despair and loneliness. Each scene seems to be dominated by a kind of mysterious surrealistic mood, which the viewer feels called upon to decipher. But when the shutter closes, no clue is left behind as to the background events that led up to this momentary image. There is no resolution to the disquieting feeling and uncertainty each image provokes.